Martin-Baker has a long history of commitment to in-service product support and continues to supply spares to more than 90 air forces worldwide. 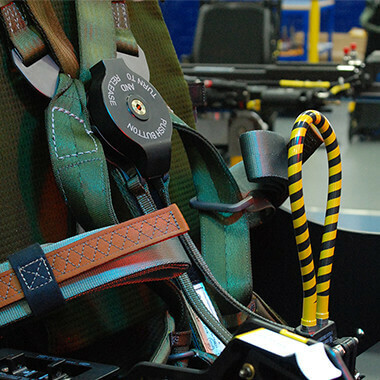 We produce spares for all seat types in service, ranging from the latest design to legacy systems which have been in service for over 40 years. From spare parts to full, integrated support packages, Martin-Baker provides reliability, maintainability, safety, logistics and all other support functions to our range of international customers.On top of pursuing in-service support concepts that are tailored to suit each customer, we’ve developed spares-usage mathematical models to predict both scheduled and unscheduled requirements. Our Field Service Engineers can be deployed to customer facilities during all phases of the design life for the escape system. From performing trial installations to assisting with initial integration, Martin-Baker is committed to helping the customer at all stages of the design, development through to production. We also offer services to retrofit and complete fleet installations using Martin-Baker products – check out our New Seat Installations & Retrofits page for more information.